Split Pea & Ham Soup is one of the best soups ever, in my opinion and the secret is the ham bone. 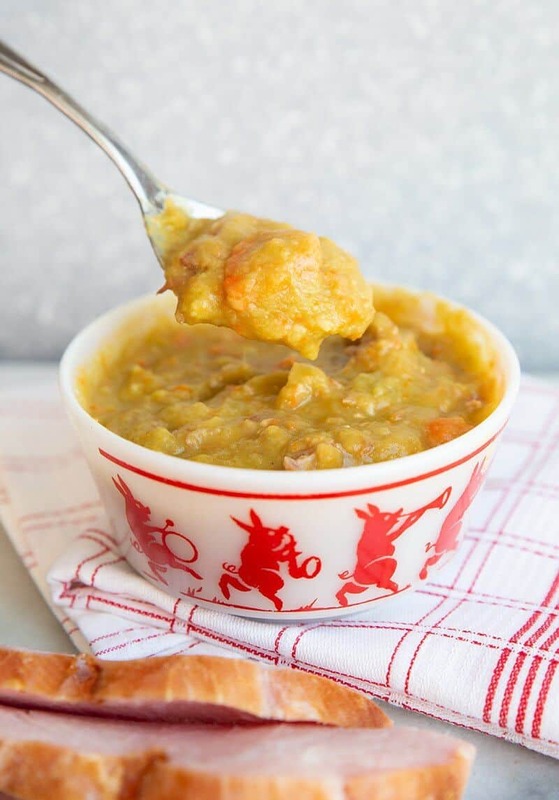 Ham bone split pea soup is the pinnacle of split pea soups and it’s probably because you don’t get it that often. All colour aside, this is one of my favourite soups in the whole wide world, no exaggeration. 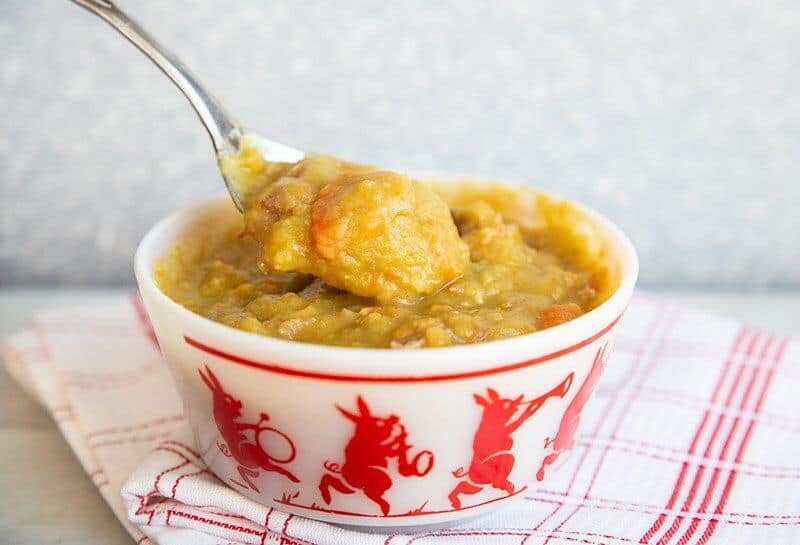 Split pea soup just HAS to be made with a ham bone (yes, yes, I know that you can make a vegetarian one, or one without a ham bone but that’s not what I’m talking about here) to be the best split pea soup. That ham bone…and cooking it for hours….oh so good. There’s just something about that slow cooking of a ham bone that gets everything good going in this soup. It also is the world’s ugliest soup to photograph. I tried, I really did. This post has been updated from years ago and the photos are better, but it’s still a green soup. 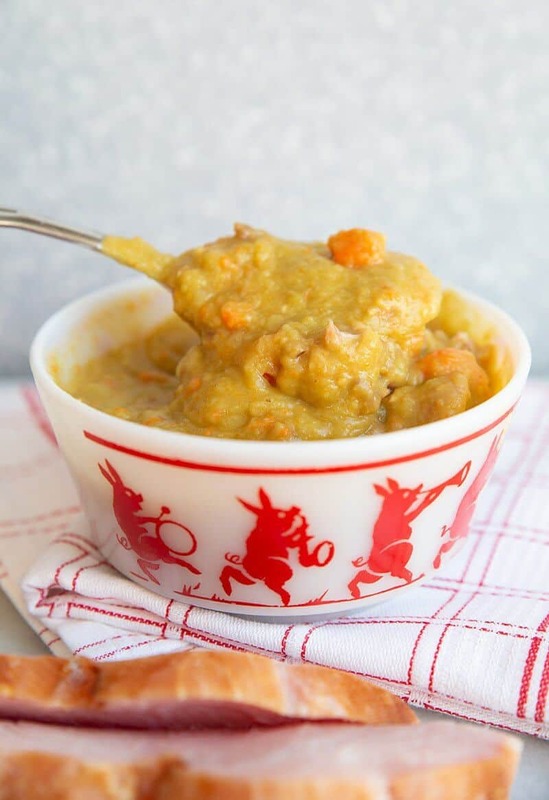 Split pea soup is also a pretty darn healthy soup for you, ham bone or not. Those peas are chock full of iron and protein and apparently I hear that vegetables are good for you. So I hear. I know that there is a lot of sodium in this, but when you weigh out the benefits of everything else it’s a pretty guilt free soup. Split pea soup has to be the most unreliable soup ever time-wise, it must be the different peas used, the amount they are dried out, who knows, but it is never the same, even if you use the same amount of peas and water. I cook mine until they are completely dissolved and make a wonderful, creamy soup. I like my split pea soup incredibly thick, so thick you can use bread to eat it instead of a spoon. You might like yours more soupy than I, so at the end feel free to add in more chicken stock until it is the right consistency for you. 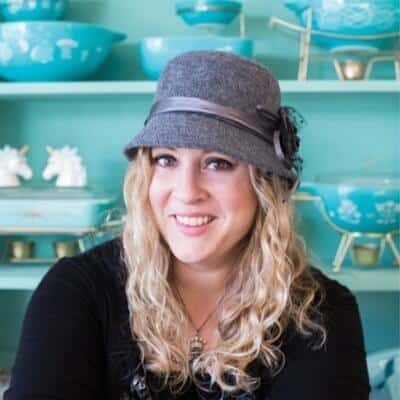 PIN THIS RECIPE to your DINNER RECIPES and SOUPS Boards and Remember to FOLLOW ME ON PINTEREST! How to make split pea soup using the ham bone leftover from your meal. You can also make this without the ham bone and it turns out delicious as well! Give the split peas a good rinse in a colander, then put everything in your crock pot, peas, celery, onions, carrots, ham and bay leaves. Pour the chicken stock over and stir. Add the ham bone in and nestle into the middle of the soup in the crock pot, making sure that it is fully or mostly submerged into the chicken stock. Cook on low for 6-8 hours or on high for 4-6 hours. It will all depend on how fast your peas cook, they can be unreliable with the time it takes! 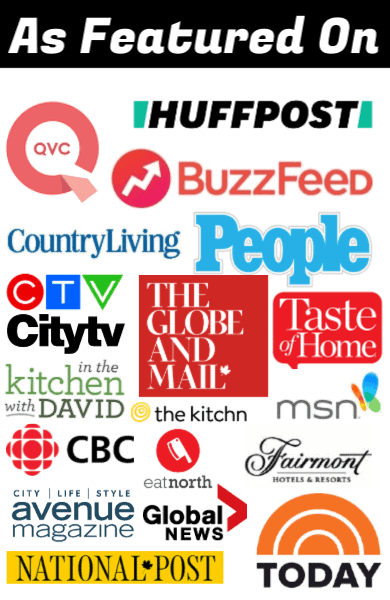 I usually look at this as an all day, on low temperature crock pot split pea soup. When the peas are soft and melt into the soup when stirred, remove the ham bone. If wanted, cut off any excess ham that might be left and mix into the soup. Mix the soup until all of the green peas dissolve into the broth. Serve. In a large stockpot, add 1 tbsp of olive oil and heat to medium high heat. Fry the onions in the olive oil until soft, then add in the carrots and celery. Fry for another 5 minutes. Pour in the chicken stock, then add in the split peas, the ham, the bay leaves and the ham bone. Stir to get everything mixed. Cover and simmer on low-medium heat ( you want it to simmer lightly, not boil rapidly) for 90-120 minutes, or until the peas are soft and dissolve into the soup. Once the peas are ready, remove the ham bone and plate it. Remove any ham on the bone that you want to add to the soup. Stir to make sure that all of the peas are dissolved, then serve. Nutritional values will vary based on types of products used and individual measuring methods. Stop looking at them then. Simple really, no is hassling you for your choices. Please send split pea recipe to my email. Don’t know how to pin. I’ve made this twice and it turned out beautifully every time! I omitted ham and used a cap of liquid smoke instead and threw in a handful of lentils, too. Delicious! Hi Karlynn, I’m making this today. I did a batch with Christmas ham bone some time ago and it was soooo good, now I’m trying without the bone. I love my soup crazy thick as well. Thanks for the post and keep up the good work. Do you think that classic Canadian fare is back bacon poutine and fried dough A.K.A a beaver tail? The pea soup is also a great first course for a more elaborate vegetarian meal or any dinner party for that matter. This is a fabulous satisfying dish that will please any palate and it s Canadian to boot. It does not get any better than that eh?